Blackjack is one of the most popular casino games of luck and skill combined, played worldwide in both land based and online casinos. Thanks to technological improvements in the field of mobile gambling, the game also made its way to mobile casinos and it can be played on various mobile devices anywhere, anytime. Online casinos may be a convenient alternative to traditional casinos, but gambling on a smart phone or tablet is a step further in that direction. Therefore, if you are a blackjack fan, you should consider playing real money mobile blackjack games on the go via your iPad, iPhone, Android device, Blackberry or Windows Phone powered smart phone or tablet. There are many online casinos compatible with various mobile devices that offer mobile blackjack, therefore, you should consider signing up with one of them. To play mobile blackjack on the move, you must have access to a mobile compatible online casino. This can be done via a mobile casino app or by directly accessing the casino on a mobile browser. But first make sure the casino is suitable for the mobile device you own. Most mobile blackjack casinos are made in HTML5 so there is no need to download anything. You simply register an account, make a deposit from the device and start playing. However, if the casino is app based, you need to download and install an app. Then create an account and load it with money. 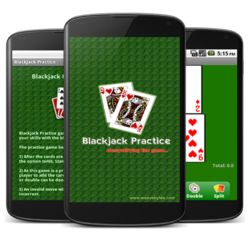 Playing mobile blackjack is generally the same as playing the game on a desktop PC. You choose the size of your bet and place chips. Then you are dealt two face up cards. The dealer gets one face up card and one face down. The same rules apply; the difference is that while playing mobile blackjack you tap on the screen of the mobile device to hit or stand a hand, split cards or double down. When playing real money blackjack on your mobile, you have a smaller viewing area because of the small screen resolutions of mobile devices and all the features and game play are compatible for mobile gaming. On the other hand, when playing the online version of blackjack, the game is fully and clearly displayed and you click with the mouse to make appropriate gaming choices. Regarding the graphics, they are better in the online version, but they are also good on mobile devices, particularly on the iPad and iPhone. Still, the graphics and game quality depend on the mobile device you use to play the game. The types of mobile blackjack variants you can play on the go depend on the mobile casino you have chosen to register with. 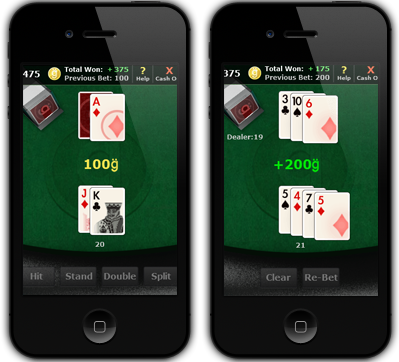 Some may offer only one blackjack game, while others may offer a couple of mobile blackjack variants. It should be noted, however, that the blackjack gaming choice on mobile is not the as big as the one available at online casinos. Common blackjack games that can be played for real money on iPad, iPhone, Android, Windows Phone and/or Blackberry include Single Deck Blackjack, Multi Deck Blackjack, European Blackjack, Classic Blackjack, Pontoon and/or Double Exposure. The variants have different house edges and slight rule variations compared to standard blackjack in terms of splitting hands, surrender options and player options. Mobile devices that allow casino fans to play mobile blackjack are the iPhone, iPad, Blackberry as well as Android and Windows Phone- powered smart phones and tablets. Therefore, if you want to play the game on the move make sure it is compatible with the device you own and consider things like game quality and functionality. Thanks to the high quality of the iPad and iPhone, players can have high end mobile blackjack experience wherever they are, any time of the day. To get access to a mobile blackjack app for real money compatible with these devices, they can download it from an online casino site or from the Apple Store. It is also possible to play the game in the Safari browser. Because of the open source characteristic of Android, the mobile operating system powers a great deal of smart phones and tablets and allows users to play real money mobile blackjack on it. The game play is smooth and the game should load fast. The users of Blackberry devices don’t have many options available compared to the owners of the other smart phone brands, but they can still play real money blackjack on the go. In fact, there are a number of online blackjack casinos compatible for mobile play on Blackberry and their number is expected to grow in future. There are also a few Windows Mobile compatible blackjack games and the newest of the bunch are the Windows Phone compatible ones. However, thanks to the improved technology, there should be more and more Windows mobile blackjack variants available. IS IT LEGAL TO PLAY MOBILE BLACKJACK FOR REAL MONEY? Whether or not it is legal to play mobile blackjack for real money on the move depends mainly on the gambling laws of the country you reside in. The governments of different countries have their owns set of laws about land based, online and mobile gambling, so if you are worried about the legality of playing mobile blackjack, you should look into the gambling laws of your country. In some countries, it is illegal to play real money blackjack on the go along with other types of online gambling, while other countries are more tolerant.